Traditions are the verses that make your family's Christmas poetry complete. Whether it's your memory of placing the last ornament on the tree as a child, baking cookies with grandma, watching “It’s a Wonderful Life” or caroling through the neighborhood, traditions are each family’s special magic that make you yearn for the holidays all year long. They connect one generation to the next to keep memories alive for decades. We asked our Iowa Food & Family Project partners to share their favorite traditions, which include many irresistible recipes. Please note, by clicking the following links, you’ll be leaving a partially funded checkoff site. The year my grandma was diagnosed with cancer, our family started a tradition called “The Peppermint Pig.” Before the gifts are opened at Christmas, we sit in a circle (there’s now more than 60 of us!) and my aunt reads about the pig, which symbolizes good health, happiness and prosperity for the coming year. We then put the pig in the little red baggie and each person hits the pig with a hammer to help break apart the pig. Then, we dump the crushed-up pig into a bowl and everyone takes a piece for good luck. We are so blessed to have Grandma still with us today! Some of my favorite holiday recipes and meals include Rack of Pork, Ham & Cheese Puff Pastry (perfect for leftover ham slices!) and Honey Balsamic Glazed Ham. You’ll definitely want a tall, cold glass of milk with these butter-rich treats! We always serve prime rib – it has been a family favorite and tradition for several years – and we especially like serving it with a horseradish sauce. It is a simple, easy recipe for such an impressive centerpiece for the holiday meal. I typically purchase a small, end ribeye roast. They are usually more tender and contain less fat. The key to roasting any beef roast is using a meat thermometer to determine doneness. Once removed from the oven, let the roast stand 15 to 20 minutes. The temperature will continue to rise 5 to 10 degrees F to reach desired doneness, and the roast will be easier to carve. For example, if you are aiming for a medium rare roast (145 degrees F), remove the roast when the meat thermometer reaches 135 degrees F. Once you let it stand for 15 minutes, the temperature will reach medium doneness at 145 degrees F.
How to Prepare the Perfect Prime Rib is a terrific resource. I love to bake, and two of my favorite recipes are Peanut Butter Balls with Rice Krispies and Coconut Macaroons. The Christmas season brings a Santa-shaped bowl overflowing with peanut clusters. The tradition of making hundreds of salty sweet peanut clusters and filling every vessel in sight – including the brightly colored ceramic bowl – began with my granny, Phyllis Olson. She taught me to melt the chocolate and almond bark slowly, to stir in the peanuts quickly, to use two spoons for the perfect cluster and, most importantly, to keep the finished product away from my papa. Since my granny passed away 12 years ago, my mom has continued the peanut cluster extravaganza in her memory. 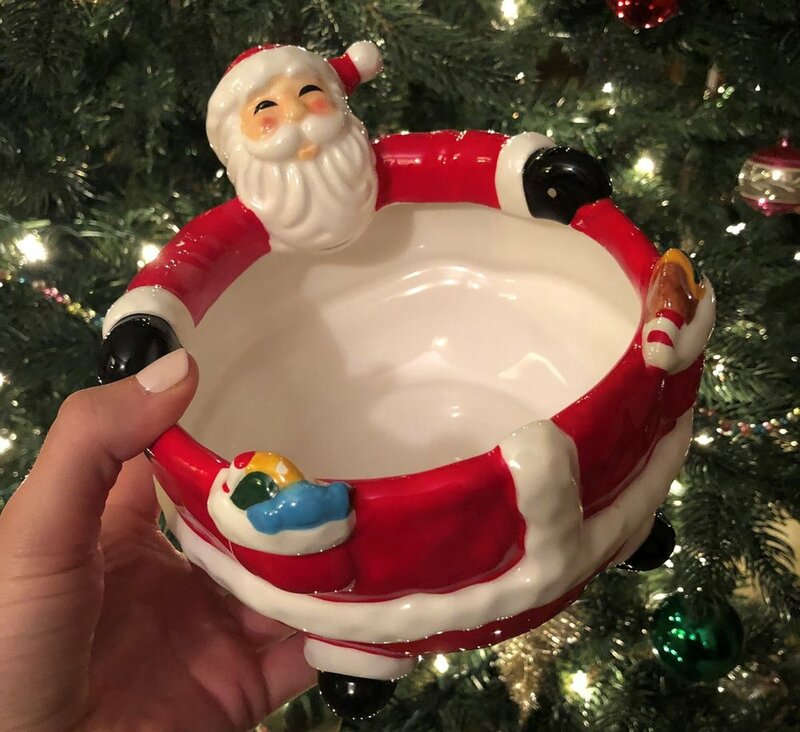 We share cellophane bags of peanut clusters with neighbors, friends and refill the infamous Santa-shaped bowl with the sweet tradition each year. Here’s a simple recipe to make your own peanut clusters! Oh, how I love Christmas ornaments! I became enthralled with Christopher Radko® ornaments in 1989 when I was awarded a trip to the National 4-H Congress in Chicago. Award winners were treated to a tour of Christmas decorations, including a stop on State Street at Marshall Fields (now Macy’s) where I fell in love with the ornate window displays. Inside the store, there was an entire tree decorated with the most colorful European glass ornaments. I couldn’t afford to buy one at the time, but I fell in love with those ornaments that reflected so beautifully upon my German roots. That year, my mom surprised me with my first Radko ornament that reminds me of my favorite childhood cat. Over the years, I’ve purchased Radko ornaments from special places we’ve visited on family vacations. Three of my favorite ornaments include: a cedar tree from Big Cedar Lodge in Branson, Missouri; the gondola at Lutsen Mountain in northern Minnesota; and “Santa Clause is Coming to Town,” which was part of the ICE! display at Gaylord Opryland hotel in Nashville, Tennessee. Every year, when my kids and I decorate our Christmas tree, we recall our favorite memories from those trips. Last year, while attending Christmas by the Lake in Clear Lake, I purchased a little red hen ornament that lights up. It reminds me of my chicken-loving grandma, who will always be a part of my most treasured memories at Enchanted Acres. My grandma spent nearly every weekend of the fall with me at the pumpkin patch for five years. Each fall, we looked forward to taking a road trip to Hoover’s Hatchery to pick up newly hatched chicks. Then, my mom and my grandma would help me give each chick a drink of water as we took them out of the box and placed them in a brooder. Instead of being overcome with sadness during the holiday season as I remember days gone by, I focus on all the wonderful memories. Winter on my grandparents’ farm was my favorite. Not only did my grandparents live close to the best sledding hill, but my grandpa would hitch up his team of Haflingers to a sled. I was known to make spontaneous trips home from college when the conditions were perfect for a sleigh ride. Memories like these keep loved ones alive in our hearts. Traditions connect one generation to the next. From the time my kids were big enough to press down a cookie cutter, my mom has hosted a holiday baking day. My 17-year-old daughter still looks forward to making gingerbread cookies each season with my mom. We also decorate a gingerbread house. My daughter loves eating gingerbread, and I love that we’re continuing a German tradition. Mix all the ingredients together, adding the flour last. Refrigerate for 2 to 4 hours. Then roll out the dough to about ¼ inch thick. Cut out cookies and place onto an ungreased cookie sheet. Bake for 10 minutes at 350 degrees F.
Winter’s Green Crops and Turkey Talk!